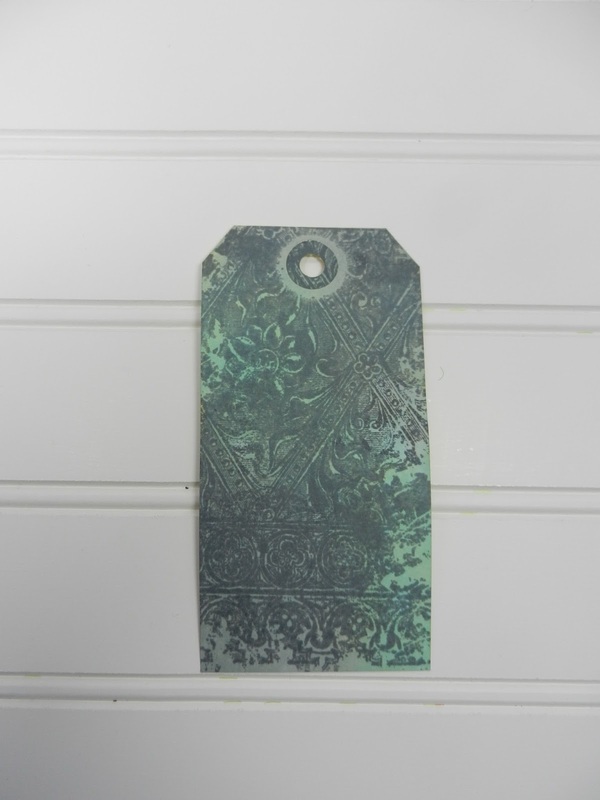 Today I am sharing a tag I have made using the Sin City Stamp - Fancy Metalwork Look Plate. One of my favorite uses of stamps is in the creation of tags. I guess you could say I am hooked on tags. 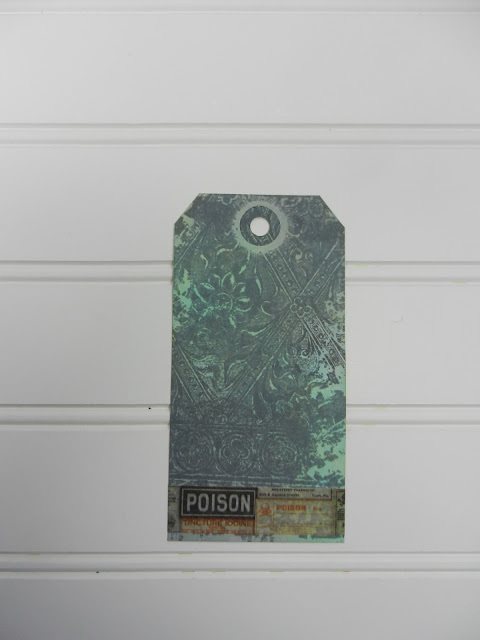 Step 1: Blend teal and gray ink onto tag to achieve the look you like. Step 2: Spray or flick water onto the inked tag. Blot the water using a paper towel. Step 3: Stamp the background with gray ink using the Fancy Metalwork Look Plate stamp. 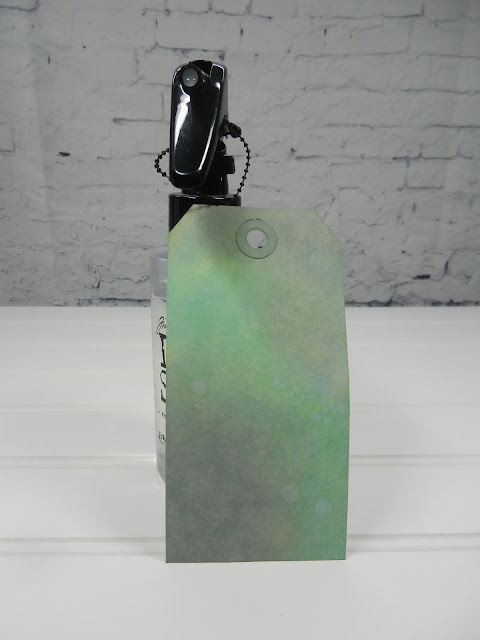 Step 4: Add washi tape with words across the bottom of tag. Step 5: Using the rub on of black birds to a position that will appear above the child's shoulder. Next ink the edges of the chipboard sentiment and affix the chipboard sentiment to the side of the tag. 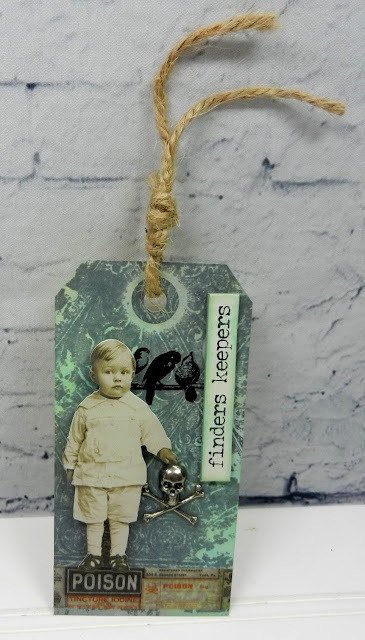 Using dimensional dots glue the child to the tag. Finally, add the metal skull and crossbones to appear as if the child is holding it. I added a hangman's knot to the top of the tag. Not everyone would want to find a skull but obviously this little boy did. He is definitely not going to give it away. I would venture to guess we all know a kid who would love to have a skull! 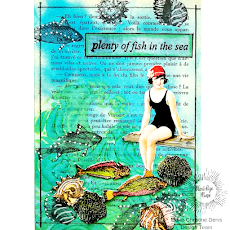 Please share your version of this tag on Social Media using #SinCityStamps. Or visit our Fan Page on Face Book.